The Community Food Systems Equity work group works to provide tools, resources, and training materials to infuse racial and social equity principles into the work of the UW Cooperative Extension Community Food Systems Team. The CFS Equity work group launched in January 2016 and hopes to grow its membership through relationships built by this 21 Day Challenge. If you are interested in learning more or getting involved, please contact Erin Peot or Lexa Dundore. New food system-focused racial equity tool available! The Food System Racial Equity Assessment tool and facilitation guide are now available on the UW-Extension Learning Store. Lexa Dundore developed this guide through several years of adaptation, feedback, and pilot research in her roles as Community Food Systems Assistant at Dane County UW-Extension, co-lead of the Community Food Systems team’s Equity work group, and as a master’s student in the Department of Urban and Regional Planning. This critical question set and analysis process is designed to support organizations and other groups in prioritizing racial equity when developing plans, programs, or policies related to the food system. While food is certainly the frame for this tool, the questions and process can still be useful in a variety of programming areas. Centering questions of racial inequities, systems of oppression and privilege, and organizational process and power in Extension work contributes to stronger programming and more just outcomes for all. When conducting pilot research with this tool, it helped partner organizations design an engagement process for offering a community center-based CSA program, and another organization consider how to best do recruitment of diverse audiences for their programming within the limitations of federal guidelines. The Food System Racial Equity Assessment Tool: A Facilitation Guide is available on the UW-Extension Learning Store for free PDF download or to print on demand for $3.50 per copy. Please share this resource widely with colleagues and community partners. For more information about the guide, please contact Lexa Dundore. Join us for a 21-Day Racial Equity Habit Building Challenge Orientation Webinar! Please RSVP for Orientation Connection Details! The national 21 Day Racial Equity Habit Building Challenge is hosted by Food Solutions New England. UW-Extension’s Community Food Systems Team’s Equity work group and the 4-H Youth Development Expanding Access Team is supporting the participation of Extension professionals and partner organizations throughout Wisconsin. This Challenge is an opportunity to commit to daily learning and action on challenging racism in our lives, work, and personal relationships. The challenge materials include resources on dismantling systemic racism in the food system, but covers a broad range of topics beyond food as well. 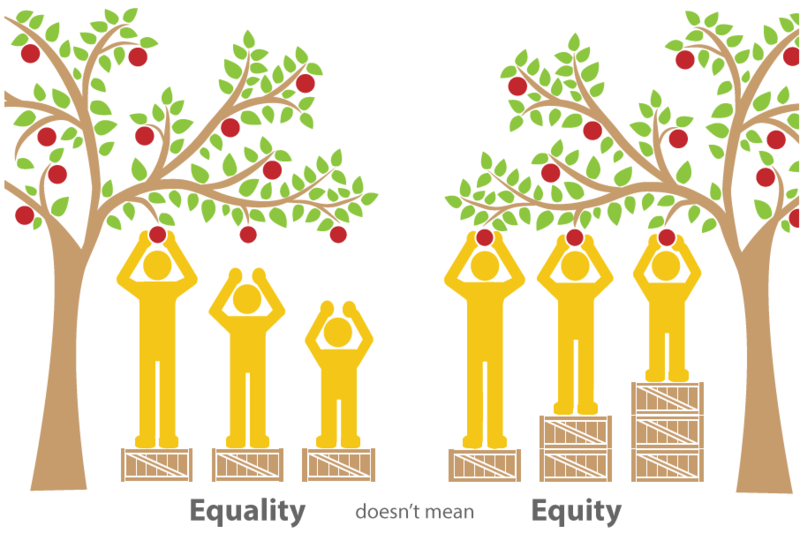 To supplement the materials offered by Food Solutions New England, we have gathered additional resources available on the Learning About Equity: A Resource List page. This flexible program approach allows each participant to tailor their learning from their own starting point. As such, each participant will get out of the challenge what they are able to put into it. The 21 Day Racial Equity Habit Building Challenge is for people of all racial and identity backgrounds seeking to deepen their understanding of institutional racism, systems of power and privilege, and contemporary thought on working towards equity. By participating in the challenge, we will advance personal commitments to action and connect advocacy networks across colleagues, partners, and friends. The April 6th Orientation webinar will provide an overview of challenge resources and situate this critical work in the context of Wisconsin’s dramatic racial disparities. Please contact Erin Peot or Lexa Dundore for questions or accommodations. Connect with other 21 Day Challenge participants! Request to join our Facebook group to share resources and reflections with partners throughout Wisconsin. 2017: 21 Day Racial Equity Habit Building Challenge: watch the orientation video here. 2016: 21 Day Racial Equity Habit Building Challenge: watch the kickoff webinar here.